Kumano-jinja is an auxiliary shrine of Hinomisaki-jinja located outside of its precincts in ‘Gongenjima’ island in the harbor of Uryruu. However there is no clear evidence to show that Hashihime Daimyoujin is actually the current Kumano Jinja. However, within the Uryuu area, the only other shrines are ‘Hayashi-jinja, ‘Aratama-jinja’ and ‘Kifune-jinja’. In addition, the Edo Period publication ‘Unyoushi’ includes Kumano (Gongen) as an old shrine which suggests that it is, indeed the successor to the ‘Hashihime Daimyoujin’. As shrine names Kumano and Hashihime don’t appear to have any connection. so, we have to delve deeper into the origins of ‘Hashihime’? :There’s an old tradition which takes place at Kumano Shrine called the ‘Mekari shinji’ (mekari being another reading of the word for ‘seaweed’ and ‘collection’). 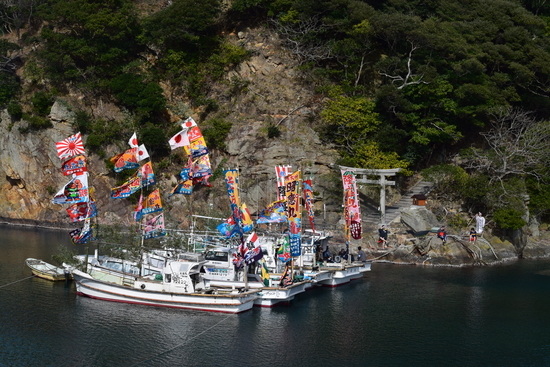 Boats are lined up in the form of a ‘bridge’ (hashi) stretching from the Uryuu bay coast to the ceremonial spot on Gongenjima where Kumano jinja is enshrined. The chief priest (from Hinomisaki Jinja) then crosses the ‘bridge’ to perform the ceremonial rites. Perhaps this is the bridge associated with the name? Again, ‘mekari’ reminds one of Mefu Jinja in the Shirakata area of Matsue city due to the same written character appearing in both words. Back in the Edo Period, Mefu Jinja was also called ‘Hashihime Daimyoujin’. A point of interest is the possible connection between ‘mekari’ and ‘bridge’. Aside from the ‘Mekari Ritual’, the original shrine history tells of an event in the 6th year of the reign of Emperor Seimu (the year 90). A seagull, having picked up a piece of seaweed washed up by the tide, flew over to the shrine, placed the seaweed on the railing, and flew away. People connect this act of cleansing the seaweed with fresh water with the Shinto rituals of cleansing before making an offering. This simple act of collecting seaweed washed up in the tide reminds us of the descriptions in the Forty –two Bay book ‘Koritoriuta’. Furthermore, Uryuu is seen in the Fudoki as ‘Ureho Ura’. The land name is written with three characters, but the last ‘ho’ which appears in the names ‘Miho’ ‘Sasebo’ and ‘Pusanpo’ is used to mean ‘port’. As for the meaning of the location name ‘Ure’, it probably refers to ‘end’ or ‘reverse/back of’ so literally meaning ‘the port area at the back of the Great Shrine (Izumo)’. January 5th of the old calendar, around the beginning of February in modern times is the date of the Mekari-shinji festival. The event is marked by the offering at Hinomisaki-jinja of Mekari seaweed collected at the same Gongenjima that appeared in the aforementioned legend of the seagull. In addition, the festival also includes prayers for the large hauls for and the safety of the local fishermen. In the New Year of the old calendar, the ritual involved a group of naked men pulling 12 boats across the water to form a bridge between the land and the Gongenjima Island where Kumano-shrine is located. The chief priest from Hinomisaki-jinja then made his way across the bridge of boats to prune some mekari seaweed. The well known brand of ‘Hinomisaki-wakame’ seaweed is produced and sold in the area. 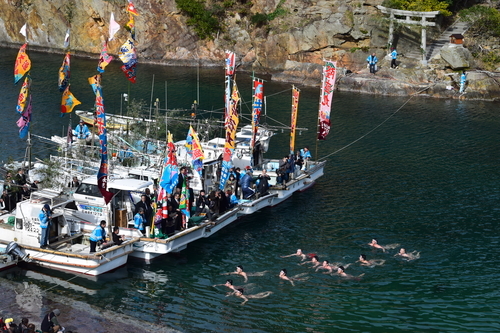 In the modern festival held on the third Saturday in October, members of the public are now permitted to cross the bridge of boats over to Kumano-jinja. Although formerly taboo on the island of Gongenjima, women are also now permitted. Back in the day, the port of Uryuu once welcomed and prospered from visits by ships on the Kitamaebune shipping route. Even today, its presence remains in the names of shops like ‘Kaga-ya’ or ‘Higa-ya’ reminding one of the Kyushu connections to the area where the boats originally set sail back during the Kaga Domain. The houses, like those in Sagi-ura lie neatly aligned the town’s streets.